All Stratos-HSSD detectors in this product range use the acclaimed combination of laser forward light scattering and the unique Perceptive Artificial Intelligence system - ClassiFire®. The three products above are of identical sensitivity capability, but vary in the recommended amount of sampling pipe. They are designed for the protection of differing capacity areas, or for incorporation into larger fire detection systems with a combination of appropriate detection devices and technologies. 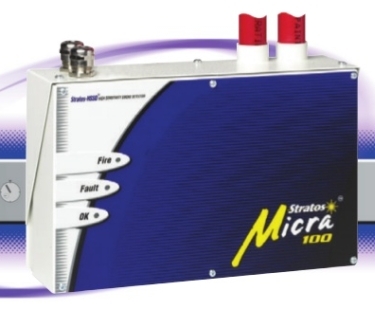 The Kidde Stratos Micra 100 detector is designed to compliment the AirSense range of aspirating detectors. Since its introduction, the Stratos-Micra 25 detector has proven a world-beater in terms of localised incipient fire detection. Now the concept has been extended to permit a maximum recommended sampling pipe length of 100 metres. The system is fully compatible with all other Stratos detectors and ancillary devices such as remote bargraph displays and the Command Module for interconnection of large quantities of Stratos detection devices. The Stratos detectors are directly compatible with a range of addressable detection panels from a growing list of international manufacturers.